On a chilly winter day, nothing tastes better than a bowl of homemade soup. So invite the kids into the kitchen to stir up something good—and learn how to make the ultimate comfort food. Most soup recipes begin with a good vegetable, chicken, or beef stock. So the next time you’re at the grocery store, stock up for winter on broth for soup making. Look for broth that is lower in sodium and does not include MSG on the ingredient list. You can also stock up on onions, canned tomatoes, kidney beans, and frozen vegetables, such as corn, peas, or spinach. Cooking a good pot of soup requires a variety of kitchen skills. You can start teaching your kids these skills when they are young—and their skills will grow as they grow! Teach them how to chop onions, crush garlic, stir soup over the hot stove, and season with salt and pepper to taste. Got leftovers? Save them for soup! All kinds of things can be tossed into soup, from leftover chopped chicken to vegetable scraps. So before you toss them, think about cooking up a pot of fresh soup. For a quick and easy way to entertain another family, plan a soup potluck. 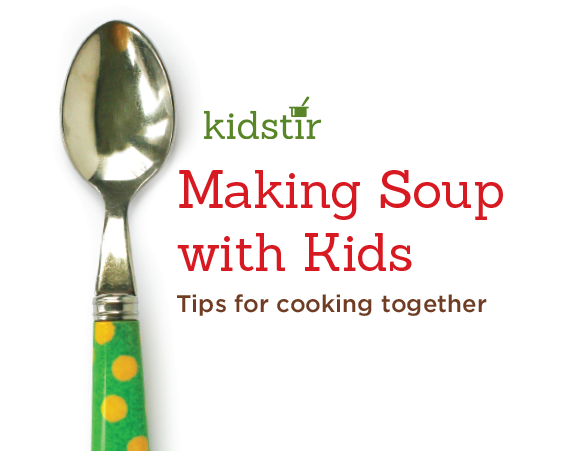 Your kids can help you choose a few different kinds of soup to make. Round out the meal with bread and salad. There’s nothing more comforting than sharing soup with friends!